So, March 22 is World Water Day again. I wonder what it means to the average global citizen? This year the theme is again powerful and pertinent. 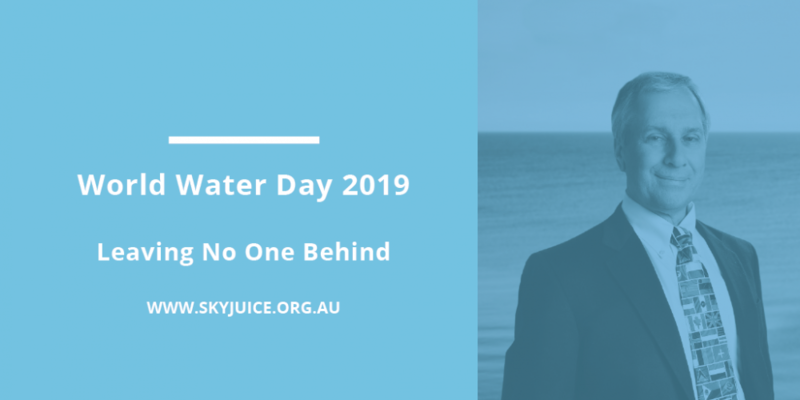 The aim of World Water Day 2019 – “that no one is left behind”, is achievable but it is still going to take a much bigger effort from everyone to reduce the horrifying statistics. Sorry to skew the message, but is overwhelmingly women and children who are most likely to be left behind. It happens everywhere and following on from International Women’s Day recently, it is timely to highlight this long-standing anomaly. The UN initiated and launched World Water Day to raise the awareness of water and its impact on all aspects of human life. It was also aimed to involve children as they were seen as motivators for future success. Each year there is a theme to emphasise the significance of this day to the world. This year the noble objective is “leaving no one behind”, so maybe it’s time for “the train to leave the station”! Last time I wrote about the Sustainable Development Goals (MSG’s) and how they originated from the Millennium Development Goals (MDG’s). More importantly to many, in 2010 the UN under the leadership of the UN Director-General’s advisory group on water, the UN recognized the right to safe and clean water and sanitation as a basic human right. The declaration stated that this is essential for the full enjoyment of life and all human rights. This did not come as easily as you might expect. There were some who saw this as a leading to claims for ‘free water’ and that the cost to the larger community, operating agencies and governments would be prohibitive. They did not prevail and the declaration was passed. The final declaration says nothing about payment and exchange of “fair value” for the provision of safe water. But despite this resolution, there are many children who miss out on access to clean drinking water. Currently, 2.1 billion people have no direct water supply at home. One in four primary schools have no drinking water service and 700 children under 5 years of age die daily from contaminated water. Where there is no water supply it is women and girls who bear the brunt of the burden for collection of water. So, if we have choices about where to place new water supplies, what locations have most impact? Where is it most cost effective and socially beneficial with secondary benefits such as education? Is the problem so great that it doesn’t matter what we do or are we are only “burning rubber on our tyres”? Many aid organizations, non-governmental authorities and foundations have recognized the value to focus on providing quality drinking water supplies to primary schools to expedite these goals. If this can be supplemented with a hybrid facility or solution with safe water also available to households, then there are much stronger reasons for this strategy. I am pleased to say that the SkyJuice Foundation has adopted this view. As part of its strategy to get safe drinking water to those in need, it is installing water supply treatment systems in primary schools. This is leveraged by working collaboratively and with assistance from other “outcome based” partner organizations. This strategy actually results in “rubber hitting the road” in real time. Collectively empowered groups are moving to ensure that sensible systems are installed and maintained in many countries, that target women and children and empower their lives. So, with that thought it is indeed a little more reassuring that something is being accomplished by small organizations. “From little things big things grow”, as they say. But there is no room for complacency. The aim of World Water Day 2019 – that no one is left behind, is achievable but it is still going to take a quantum shift of new thinking and renewed effort to reduce those horrifying statistics. Otherwise, it can seem like same old, same old – spinning wheel going nowhere!